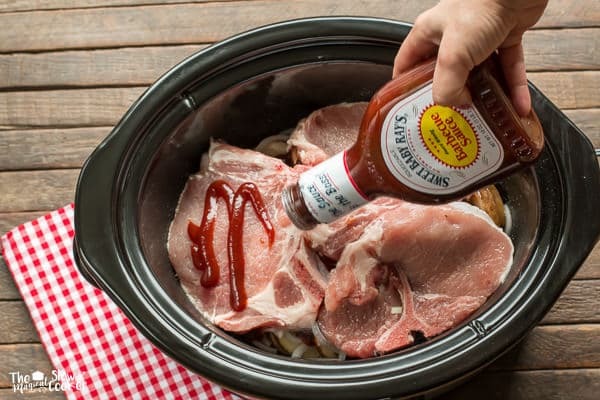 This Slow Cooker Sweet Baby Ray’s Barbecue Pork Chops and Potatoes isn’t your usual pork slow cooker meal! 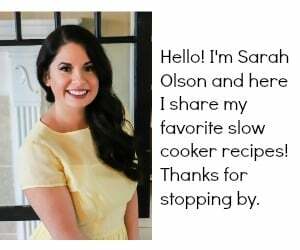 Hi Slow Cooker Friends! What could be better than pork and barbecue sauce? 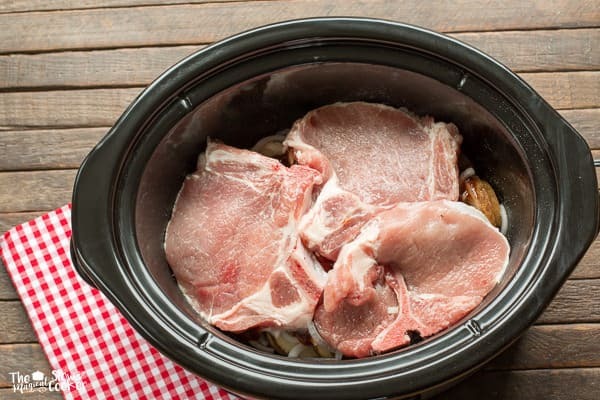 I wanted to make a pork recipe in the slow cooker that wasn’t the usual pulled pork. 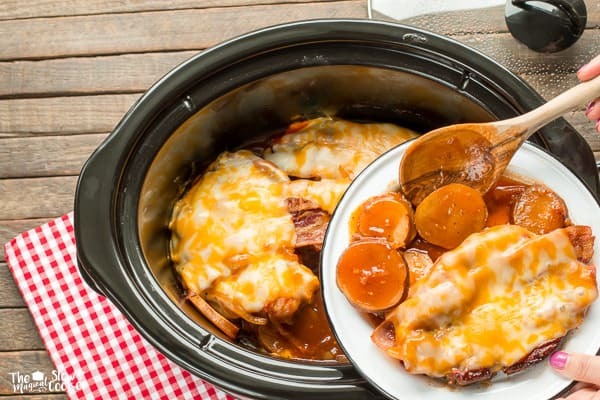 To my slow cooker I added pork chops, sliced potatoes and onions and covered that in barbecue sauce, THEN topped that with bacon and cheese! YUM! I used an entire bottle of my favorite barbecue sauce Sweet Baby Ray’s. 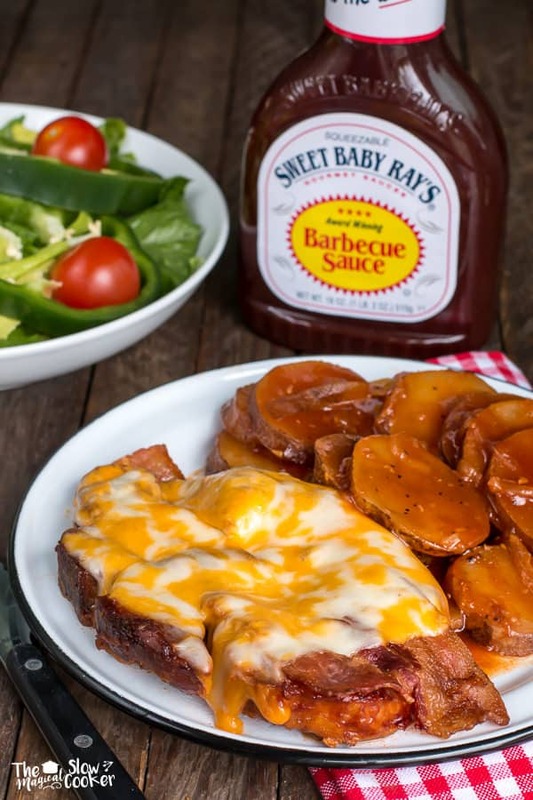 There are so many flavors to choose from, don’t feel like you have to use the original flavor in this recipe, see the other flavors Sweet Baby Ray’s has to offer here. I’m going to try the Sweet Golden Mustard next time! We had a busy weekend of birthday parties and girl scouts. This meal was easy to set up and get going on our way out the door. When we got home I cooked up bacon in the oven, then added that bacon and Colby-Jack Cheese on top of the pork. I often make a big salad on Sunday night for lunches later in the week. I used that salad for a fresh side for this meal. Look at that beautiful sauce! The pork juices and the barbecue sauce baste the potatoes perfectly! I hope you try this hearty meal. 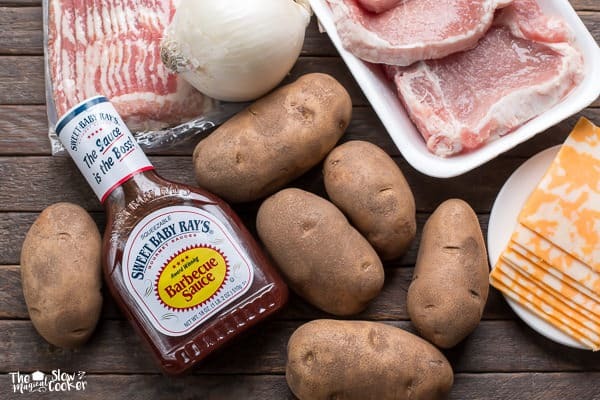 Which Sweet Baby Ray’s Barbecue Sauce will you choose? Have a great week! 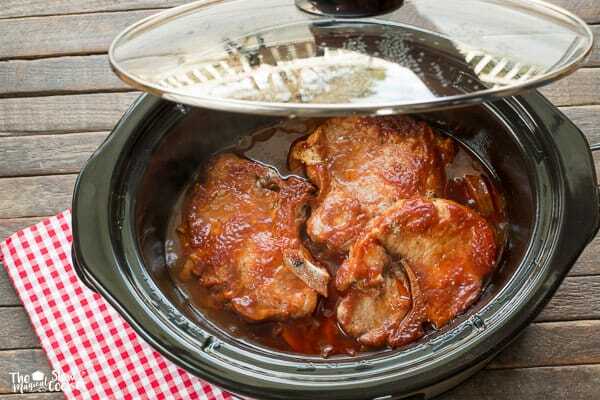 Spray a 6-quart oval slow cooker with non-stick spray. Place the potatoes down in an even layer. Sprinkle over the onions, and salt and pepper. 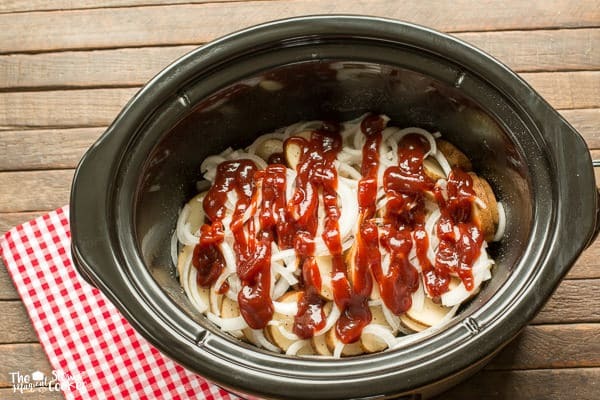 Squeeze about a cup of the barbecue sauce over the potatoes and onions. Lay the pork chops next in an even layer. Add the remainder of the barbecue sauce over the pork chops. Cover and cook on HIGH for 4 hours, without opening the lid during the cooking time. After the cooking time is through, add the bacon slices over the pork, then add the cheese slices. 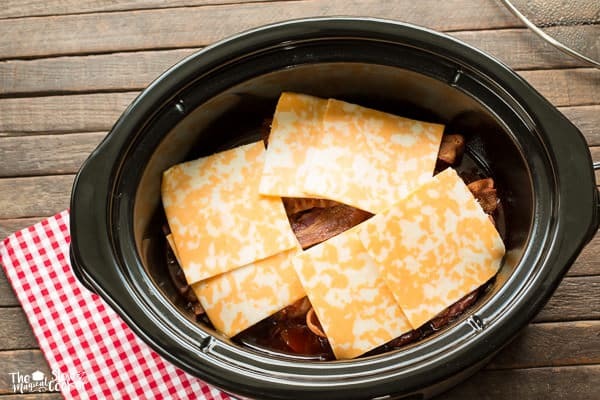 Cover for an additional 10 minutes to allow the cheese to melt. Below is a video of the making of this easy meal! Couldn’t be easier! I received compensation for this post, though all opinions are mine. 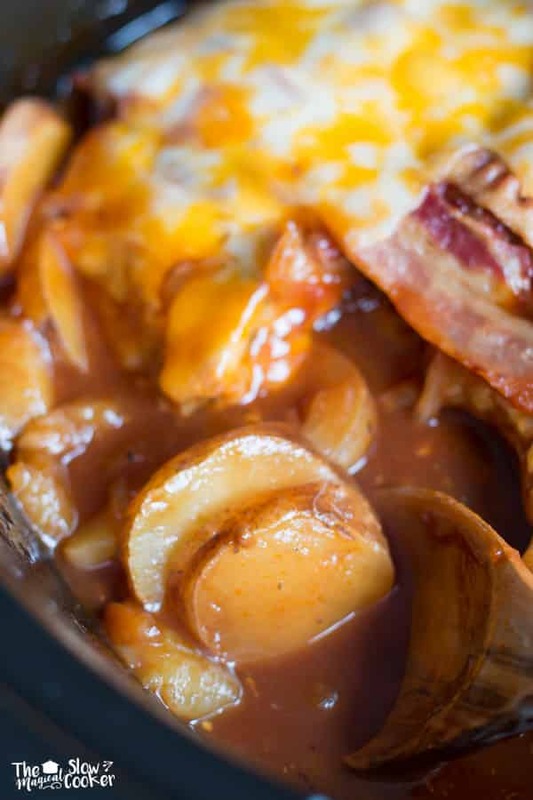 So love all the layers in this slow cooked meal! Sweet Bay Ray’s original flavor is my favorite, so I wouldn’t change a thing! We love Sweet Baby Ray’s. We always have it on the house. I need to make this one for my family. Richard loves pork chops and I bet he would really love those! How did it turn out with the chicken? I was thinking of doing the same thing. Do the porkchops have to be thawed? what device are you using? My laptop, PC and mobile the banner isn’t close to the recipe. I really want to fix this but don’t know where to look to see where the problem is. I have an iPhone, do you have something different maybe? Ipad, i also had a problem getting to it. I took away that side bar, there was no fix it. 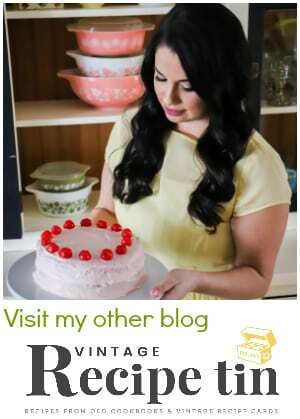 I hope you can view the recipe better now. I’ll try it, replacing bbq sauce with garlic butter. How did they turn out on low? Yes – I also wanted to cook them on low (while at work). Did it work out okay? Made the Slow Cooker chops and Potatoes and thoroughly enjoyed it. So simple and so good. I left out the bacon and cheese. This is a keeper. Do you brown the chops first? Plan on making it this Thursday. I did not brown them first. You can if you want, it wouldn’t hurt the recipe. Loved the pork chops(didn’t add the cheese) but…the potatoes weren’t a hit=( too much with the bbq sauce. Will make again with out the potatoes. Thanks! Can this go on low for 8 hours instead? I have not tried it. The sugar in the barbecue sauce could make it burn around the edges. So I don’t know what happened with mine. It sounded so delicious!! But it wasn’t A good majority of the potatoes were undercooked and the chops turned into bricks. I reeeeaaaalllly wanted to love this one! did you leave the lid on the entire time? That would effect the potatoes cooking, and not let the pork get tender. My husband hates BBQ sauce. Could I substitute w something different? Like maybe A-1? I personally wouldn’t use A-1, it would be too strong. You could go another direction and use cream of mushroom soup with a little milk mixed in and some seasonings? Sorry I am not too much help! Glad you asked that question as well my husband doesn’t like it neither. How did it turn out? Did you still use the bacon and cheese? This was great! I like to tweak every recipe I use though. So instead of spraying the pot, I buttered it with a soft spatula. I also added a little onion powder and rubbed on the seasonings. I did not have sliced cheese but the shredded turned out awesome. If you are wondering if you can cook it longer, you can! (I had classes all day.) I had my crock pot on for 8 hours on low heat. Worked like a charm. 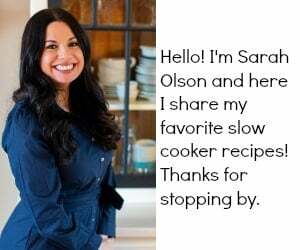 Thanks for the tips Sarah! Tried this tonight, pork chops were ok, didn’t care for the potatoes. My husband gave this recipe a 1 1/2 out of 5. Chops turned out a bit dry. I sliced potatoes to thin so they were soft. Good flavor. Next time I will cut potatoes thicker and reduce time to 3 hours. My slow cooker is a smaller round version. Ew I cooked this and it tastes disgusting. No real flavor to the meat. I followed exact instructions and was very disappointed. 4 hours…don’t waste you’re time. Very good, my husband dont like pork chops or onions, i didn’t tweet anything and he LOVED it, he didn’t even know there were onions there. Good job Sarah and thanks for sharing. Thanks Kehau. That is so great to hear. My stove is on the fritz so we are having to do everything in the crockpot right now. Can I add the bacon earlier and let it cook with the porkchops? It can be added earlier if it is cooked. Can you cook it in the microwave? 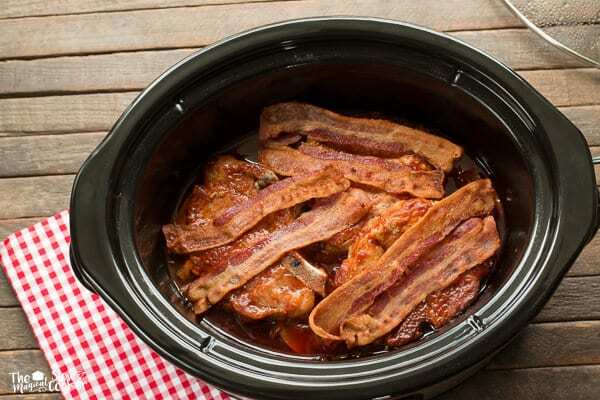 Uncooked bacon in the crockpot can be greasy and mushy. I’m thinking, potatoes, onions, pork chops then bbq sauce. Thoughts? Honestly, disappointed. What exactly is “5 cups sliced russet potatoes”? How many potatoes? What is the ultimate outcome from a weight standpoint? What thickness? This recipe is way too vague! And the same goes for “1 cup sliced white onion”. Am I honestly supposed to put these items in a measuring cup? Nope. No cook would say that. After four hours, I took my pork chops out. They were done. I’m now on hour 8 for the potatoes. Shame on me if I cut them too thick, but I only tried to follow the slices as depicted in the photos. If you want to make this recipe, it has great taste. Just beware of the vagueness and slice thin. 5 cups of sliced russet potatoes is 5 cups of sliced russet potatoes. Yes I used a measuring cup. I did not say use a certain count of potatoes because I’ve never seen two potatoes the exact size. I rarely use a whole onion in a recipe as they are too large, hence I stated to use 1 cup. 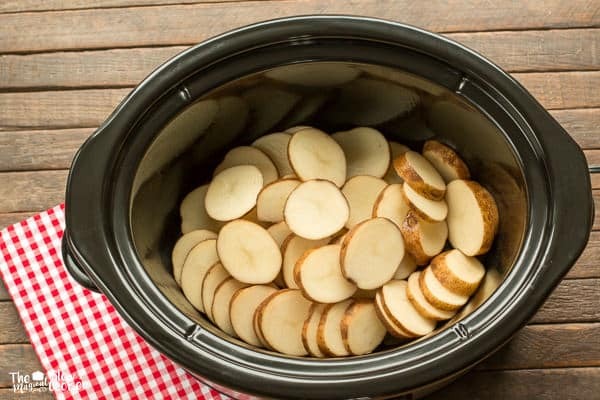 The potatoes should have cooked no matter what size you cut them if you left the lid on the entire time and have a slow cooker that cooks accurately. I have it on the cockpot right now. Cooking it on low for 8 hours but I used thin boneless pork chops and I seasoned my pork chops with garlic powder, adobo and sason before putting them in the crockpot. In the crackpot now I used the Buffalo Sweet baby Ray’s has anyone tried that??? Pretty easy out figure out your time variation if you are use to your crockpot temp.I’m using thick chops so I’ll cut my potatoes the thickness I know it will cook both done at same time. Low 8 hours. That’s great Misty! I hope you like it! Hi Sarah! Had this for lunch today and it was really delish! However, the onions seemed to have disappeared! The chops were tender, but probably should have pulled them out about 45 minutes before finish. Back to the onions, I think next time I will carmelize them and put on top of chops after cheese and bacon. Thanks for the recipe!! This was delicious! I mde it for the first time tonight and my husband said they were the best pork chops ever! 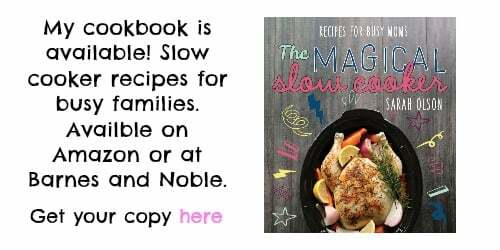 I’ve made this recipe numerous times now and my non-meat eating kids even love it. I’ve used both thick and thin sliced chops. I’ve used multiple flavors of bbq sauce. I’ve even made it with just the porkchops and no onions, potatoes, bacon, or cheese. I’ve cooked for both 4 hours on high and 8 hours on low. Every time it has turned out amazing. The chops are always tender. Potatoes always cook. The number one key to this recipe is to NOT take the lid off while cooking. But this a good rule to all crockpot recipes. This is a family favorite and requested at least once a week. Side note: we never ate porkchops in our house before this recipe. OMG this was soooo good! I did a few variations: sweet potatoes instead of white potatoes , added chopped garlic, no bacon or cheese. I didn’t have Sweet Baby Rays but used a smokey bbq sauce. Also, cooked it in the oven at 325 for an hour, potatoes were not done. 425 another half hour and they were perfect! Thank you for sharing! Sweet potatoes are such a great idea! What is the calorie count on this?